Chocolate and banana. A combination that can’t go wrong. I only like bananas when they are just ripe and never get round to eating them so always seem to have overripe bananas in the kitchen (hence the number of banana cake recipes I make!) 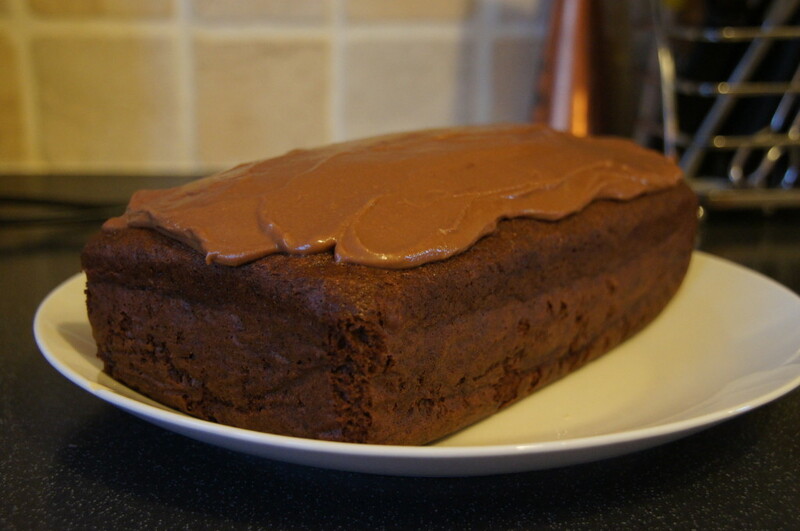 I had a couple of bananas that had gone brown and decided it was the perfect opportunity to try this recipe out. It’s a BBC Good Food recipe that you can find here. It will be making it’s way into work tomorrow to help beat the Monday blues! You will need a 2lb loaf tin. The only downside to this recipe is that it does require quite a few bowls in the preparation. The cake can be frozen (un-iced). 1) Heat oven to 160C/140C Fan/Gas 3. Grease and line a 2lb loaf tin with baking parchment (I find using 2 strips laid as a cross is easiest – allow it to come 2cm above top of tin). 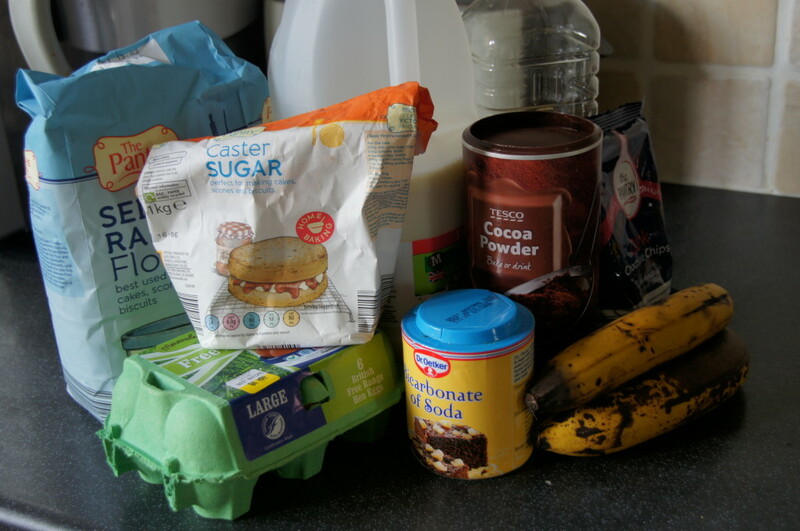 2) Mix the sugar, flour, bicarbonate of soda, cocoa powder and chocolate in a large bowl. 3) Mash the bananas in a bowl and stir in the whole egg plus 2 yolks, followed by the oil and milk. 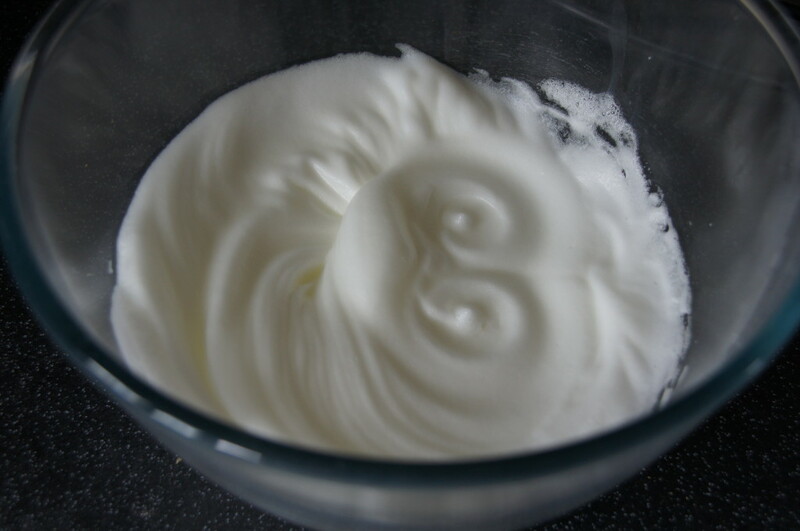 4) Beat the egg whites until stiff. 5)Quickly stir the wet banana mixture into the dry ingredients, stir in a quarter of the egg whites to loosen the mixture, then gently fold in the rest. 6) Gently scrape into the tin and bake for 1 hr 10-15 mins, or until a skewer inserted comes out clean. Cool in the tin on a wire rack. 7) To make the topping melt the chocolate and soured cream together in a heatproof bowl over a pan of barely simmering water. Chill in the fridge until spreadable (this will take a little while – approx. 1 hour). 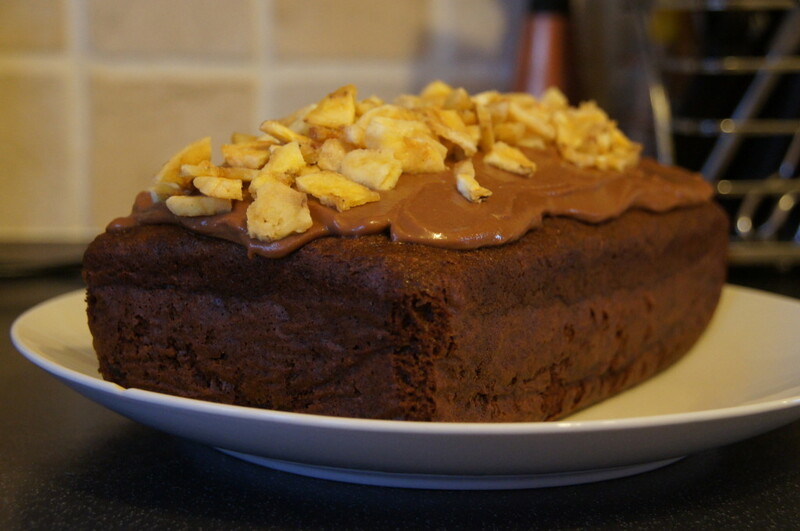 8) Remove the cake from the tin, roughly swirl the icing over and scatter with the banana chips. Bananas are so yummy; a tasty combination with chocolate! Can’t wait to try it tomorrow!